Born in Ballarat, but living in Melbourne when war was declared, Hines enlisted for service with the RAAF in 1942. While training at various establishments around Melbourne - including Point Cook and Laverton - Ron played as often as possible with his home team - Coburg District - as well as with the Air Force in inter-service matches. Over the next two years, Hines was a regular senior player. 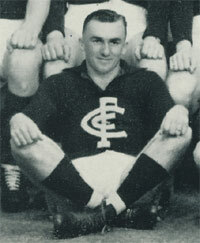 His 20 matches on a wing or at half-forward in 1945 included Carlton’s easy victory over North Melbourne in one Semi Final, followed by a stirring win over Collingwood in a bitter and physical Preliminary Final. In the aftermath of that bloody clash, Carlton's Fred Fitzgibbon was found guilty of striking Collingwood enforcer Len Hustler, and suspended by the tribunal for four matches. A few days later, Hines also suffered a huge disappointment when he was omitted from the Grand Final team to play South Melbourne, and replaced by Alex Way. As has been extensively documented, Carlton then went on to beat the Bloods by 28 points in the most spiteful and controversial Premiership play-off of them all. Contributors to this page: WillowBlue , Bombasheldon , molsey , PatsFitztrick , tmd1 , Jarusa , nikki and admin . Page last modified on Wednesday 09 of January, 2019 07:10:12 AEDT by WillowBlue. 1982 Rd 3 Mike Fitzpatrick. 2009 Rd 2 - Gibbs & Cloke celebrate a goal.